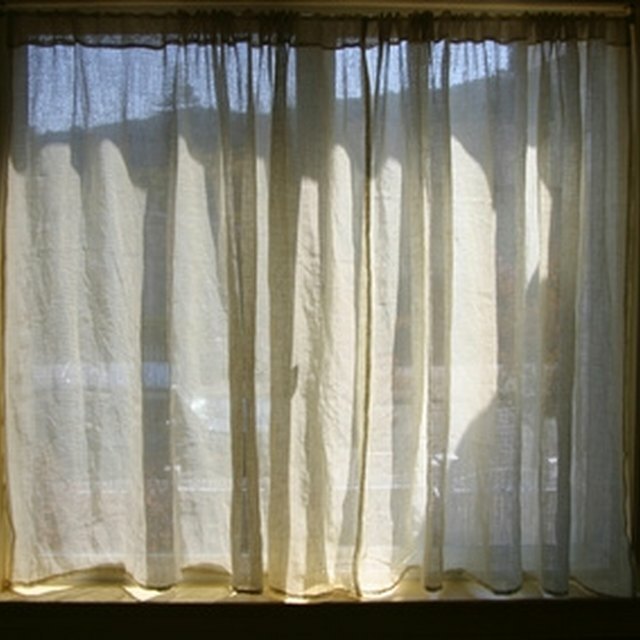 Muslin curtains are a great, inexpensive way to create window treatments with relative ease. The fabric is easy to cut and sew and launders nicely. Purchase muslin in white or off-white to coordinate with any decor. Measure the window. Add length for the position of the curtain rod and for the hem, depending on the desired length (bottom of the sill, cafe curtains, floor length). Consider making the curtains 1 1/2 times the width of the window for average fullness and two times the width for maximum fullness. Remember that each panel has a 1 1/2 inch hem along each long edge. Calculate the amount of fabric necessary to cover the window. Select fabric width of 45 inches. Add 5 inches to each panel for the rod casing and bottom hem. Launder the fabric to pre-shrink it. Press the fabric while it is still slightly damp. Cut lengths of fabric for each panel. Seam the length of fabric together for panels that exceed 42 inches in width. Press the seam open and finish it with seam tape, hemming or serging. Hem the long edges of each panel by turning under 1/2 inch and pressing in place. Turn under another inch and stitch in place. Turn under 1/2 inch along the top and bottom edges of each panel. Turn up a 2 inch hem along the bottom and sew in place. Turn down a 2 inch hem at the top of each panel to create a rod casing. Increase the depth of the rod casing to create a top ruffle. Create a deeper hem, and then sew a seam parallel to the bottom edge of the hem to make a sufficient rod pocket. Allow ease in the rod pocket so the curtains can slide easily back and forth. Measure the panels carefully as work progresses. Make sure that the panels for a single window are measured and sewn identically. Press the panels carefully before hanging. Add novelty embellishments as desired. Sew ribbon across the hem or sew colorful button along the bottom portion of each panel. Make muslin curtains for a child's room, then add the child's handprints in fabric paints. Pour a little paint on a paper plate, coat the child's hand and press firmly and evenly on the fabric. Make a row of handprints across the hem or all over the panels.